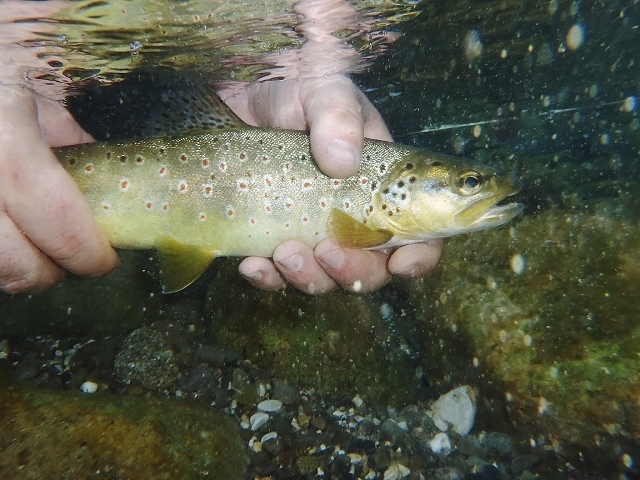 We received this great article from ESF reader Vince Brandon about some fishing he did in Tuscany this summer. As a reward for giving up smoking after nearly 35 years, my wife had agreed to let me divert the money I had saved into a summertime Arctic fishing expedition. Unfortunately, the planned trip was cancelled but almost simultaneously a chance meeting with an old friend from the Italian Property Gallery lead to an offer of a Tuscan holiday. 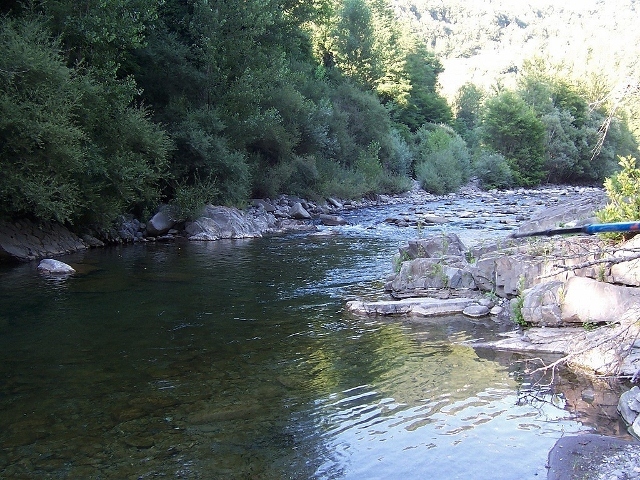 A quick bit of research found that there was plenty of fly fishing opportunities in the region and some sound advice lead to me to seek the services of Moreno Borriero as a guide. For those who are not aware of him through his rod making and guiding exploits, Moreno was brought up in South Africa before moving to Italy and speaks fluent English and Italian. During the long tedious wait for the holiday, regular correspondence with Moreno lead to the selection of a no-kill zone of the Torrente Lima run by the ZRS Lima as our venue. The ZRS Lima promotes the values of the fishery to the local economy, they also maintain and improve the local environment and promote conservation of the fish stocks. However, it was at this point I made a mistake, trusting an online translation that told me Torrente was a stream in English. I have followed the maxim that a stream is a stretch of waterway that I can jump across (in my youth) without getting my feet wet. My first view of the Lima while out walking in Bagni di Lucca told me that in Italy, the scale is slightly different and Evel Knievel would have found it a challenge to jump. On the appointed day, Moreno arrived to collect me and we went for an excellent lunch before collecting the permits and moving onto the water. In the mid-afternoon July sun, the temperature was about 35 degrees with blue skies overhead. At home, I would be sat waiting for it to cool down before lighting the BBQ, not putting on chest waders to go fishing. However, Moreno was amply prepared having stocked up with litres of cold water and took me to a shady pool while checking my set up. He explained that with the water clarity, it was necessary to fish with tapered leaders of about four metres down to 7X and he sorted out my terminal tackle. While my homemade small stream 7ft 9 inch 3wt rod was adequate, something a bit longer and with more backbone would have been ideal. We worked our way up river as the sun dropped and moved into more open water. The next few hours were frustrating as I was struggling with the length of the leader and the unfamiliar conditions; missing takes and parting company with some feisty fast rising fish. Moreno was a calming influence, providing encouragement and calling the odd break if the red mist showed. However, it finally clicked and a beautifully conditioned fish came to hand. During our travels, we saw some very large fish. 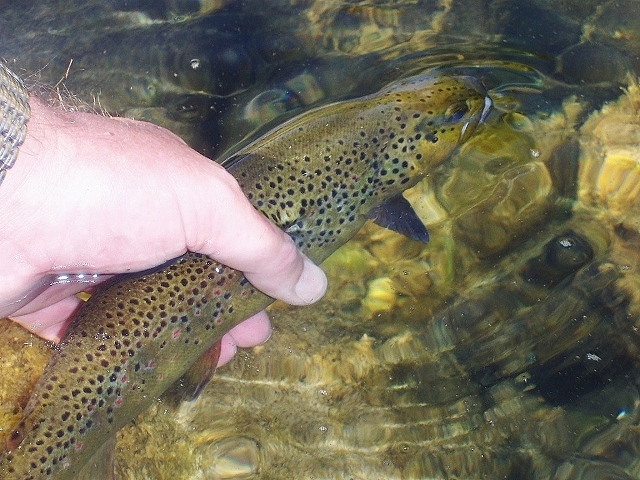 I find size very hard to gauge especially in such clear water but saw 2 fish that were easily in excess of 20 inches. I had to have a go but large fish do not become large by being stupid. As the afternoon faded in to the evening, we reached the final pool with Moreno continuing to coax me along and pointing out likely lies. As the sun dropped, it seemed that every nymph in the river decided to hatch and every fish in the river simultaneously decided to rise. Moreno termed it the frenzy and I have never seen anything like it, there were so many rings it looked like it had started raining. Of particular note was a fly that he called the red spinner, it was similar to a LDO, up to 1 ½ inches long and scarlet red. There were clouds of this type of fly and the fish loved them. Unfortunately, there are no pictures of the frenzy as I was casting like a man possessed and finished off the day with a gem of a fish that would not give up. Moreno dropped me off home after a pizza and a beer, he is a fine gentleman and good company, and I hope that I have met another long-term friend. 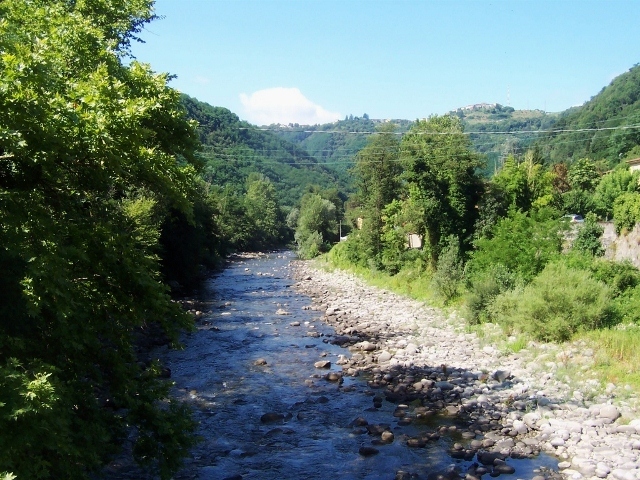 Before this journey, I had never heard of Tuscany as a fishing destination but Moreno told me about other waters he fishes such as the Serchio and the Tevere where there are large grayling as well as trout. When I am no longer tied to the school holidays, I can see me spending lots of time there in the cooler months; however, I am prepared to think again if it means that I might miss out on another frenzy. Getting into Tuscany is easy with Easyjet and Ryanair flying into Pisa airport. Travelling about by road or rail is painless and the food is, of course, legendary.